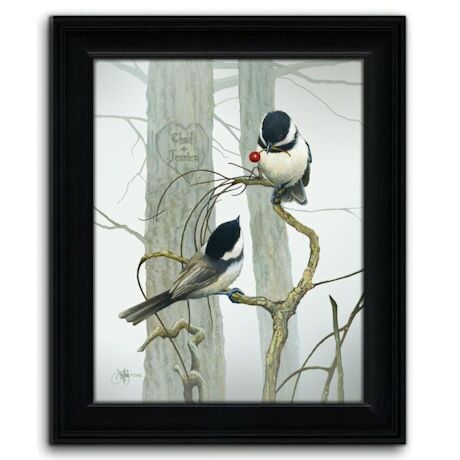 A pair of Carolina chickadees perch in a tree, gazing tenderly at each other. A tree nearby is subtly carved with a heart and the names or initials of your choice: newlyweds, newly engaged, or a couple celebrating an anniversary. Published on fine art paper and framed under glass in a 14" x 17" contoured frame. Made in USA. Specify names (up to 13 characters each) or initials. Ships ready to hang. Allow 2-3 weeks. No rush delivery or gift box. Item can only be shipped within the Continental US.